Stay safe, comfortable—and within your budget—by picking the perfect surface to surround your swimming pool. For refreshing summer fun, nothing beats a backyard swimming pool. While the water is the main focus, it’s the decking around it that determines how well the pool fits into the landscape—and how safe it is for swimmers. Successful pool decking should provide a secure walking area between pool ladders, diving boards, and slides, as well as a place for lounging. If you’re considering adding decking around your pool—or rehabbing the deck that’s already there—keep reading to learn what to look for, plus how-to tips on design and installation. Poured concrete has been the material of choice for pool decking for decades because it’s durable and water-resistant. When finished with a brushed surface, poured concrete allows swimmers to walk barefooted without the risk of slipping. • Pros: Poured concrete can be formed and poured in virtually any shape you like; curves and geometric patterns are doable. This durable surface is also fairly affordable, costing $5 to $6 per square foot for professionally installed concrete, or about $2 to $3 per square foot for just the materials if you plan to do it yourself. • Cons: Concrete is really only do-it-yourself-friendly if the pour is small—six foot by six foot or less—and you have some experience working with the material. Larger slabs should be left to the pros because concrete can begin to set within minutes on a hot, dry day. If you don’t know how to smooth it quickly, you could end up having to break it out and start over. Pre-cast cement pavers, a good alternative to poured concrete, can be purchased in a variety of geometrical shapes, including squares, rectangles, and octagons. • Pros: Homeowners can choose from a handful of gray and earthen tones, and installing cement pavers is a DIY-friendly project. The pavers are non-slip and affordable, running $2 to $4 per square foot. Add another $2 to $3 per square foot if you want professional installation. • Cons: If they’re not installed correctly over an excavated bed of sand or gravel, cement pavers can sink, creating an uneven decking surface. Brick is another DIY-friendly option, which installs in much the same way as cement pavers—over a bed of sand to keep the material from moving. Brick is slightly more expensive, ranging from $.50 to $5 per brick, depending on the type, and professional installation will set you back another $2 to 5 per square foot. Brick lends the landscape a classic look, making it a good choice for historic homes. • Pros: Brick is durable and homeowners can opt for a variety of colors and installation patterns. Choose paver bricks (the ones without holes) for decking. • Cons: Installation is time-consuming, because bricks are small and each one must be set individually. Also, dark bricks are likely to absorb heat and can be quite hot underfoot. Wood is a smooth choice that feels wonderful underfoot, but not all types are suitable for pool decking. You’ll need a good exterior wood, such as redwood, teak, cedar, or ipe (an exotic hardwood), to repel water and insect damage. Wood decking requires the construction of a floor joist system on which to install the decking boards. If you’re experienced in basic construction principles and hope to DIY, the materials to install wood pool decking will run $3.50 to $5 per square foot, depending on wood species. Pro installation will add another $5 to $10 per square ft.
• Pros: Wood decking is a great way to update an existing concrete or brick patio because it can be constructed right on top. It’s also the material of choice for building stairs and decks around above-ground pools. • Cons: Wood is a product of nature, and even the most weather-resistant types require an annual application of a sealant for protection. For long-term use, wood decking may require refinishing every three to four years, which includes sanding down the surface and applying a sealant. Stone tile, an upscale material available in a variety of natural choices, such as travertine, limestone, and sandstone, lends the landscape a natural look. Only unglazed stone tile should be used in a pool setting—glazed tile can be slippery when wet—and for comfort underfoot choose light shades that won’t absorb too much heat. • Pros: For sheer good looks, it’s hard to beat stone tile, which offers a graceful surface for lounging and entertaining. It also feels soft and smooth to walk on. • Cons: Considered a premium pool decking material, you’ll pay between $5 and $15 per square foot for materials alone. Professional installation can add another $3 to $18 per square foot, as some contractors may suggest pouring a concrete slab and installing the stone tile on top. 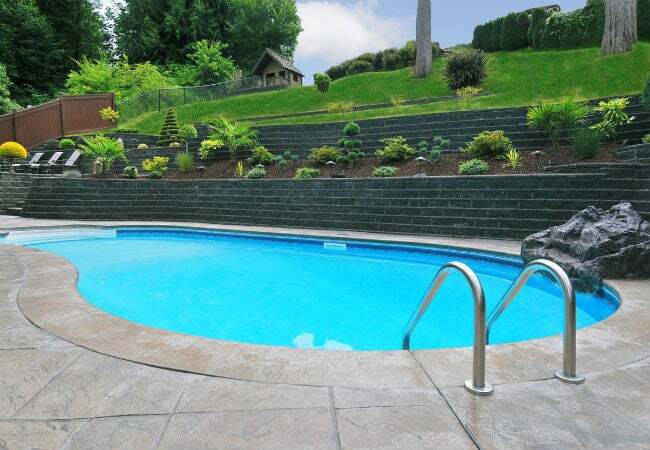 Surface coatings contain epoxy, or a combination of polymer resins, sand, and cement, which allows them to bond tightly to concrete surfaces and cover aging concrete pool decking. They provide a non-slip surface that resists water and pool chemicals, as well as harsh UV rays, so it won’t turn scorching in the summer sun. A variety of spray-on and roll-on products are available in both clear and opaque colors to update, seal, and add texture to the surface of the concrete. • Pros: These coating products are great for treating existing pool decks that are too slippery or in need of a facelift. They’re waterproof, low maintenance, and DIY-friendly, running $1.50 to $2 per square foot for materials; pro installation will add an additional $2 to $4 per square foot. • Cons: Coating treatments are a surface fix but they won’t fix deeper problems, such as cracking or settling of the concrete. Whether you’re installing the pool decking yourself or having a professional do the work, keep the following tips in mind. • Call before you dig. Even if you’re only excavating only a few inches, call DigSafe (811), a free national service that will notify the utility companies in your area so they can make sure their buried lines won’t pose a problem. • Obtain the proper permit from your local building authority. Many communities have rules that restrict installing solid surface, such as concrete, in an easement or over a utility line. It pays to check before you start rather than have to remove a portion of the decking. • Consider the cost of curves. The cost of professional installation for curved decking will be higher than it is for square and rectangular designs. • Factor in a slope. Poured concrete, tile, brick, and paver pool decking needs a slight slope in order for water to drain. (With wood decking, water drains away between the boards so the slope is unnecessary.) The slope should be one-quarter inch per lineal foot and should slope away from the pool to keep dirty water, leaves, and debris from washing back into the pool. • Add a channel if necessary. If you have extensive pool decking that runs from your home all the way to the poolside, consider installing a channel drain somewhere between the two points to collect water and allow it to drain away to the side of the deck or a storm rain. • Don’t forget the foundation. 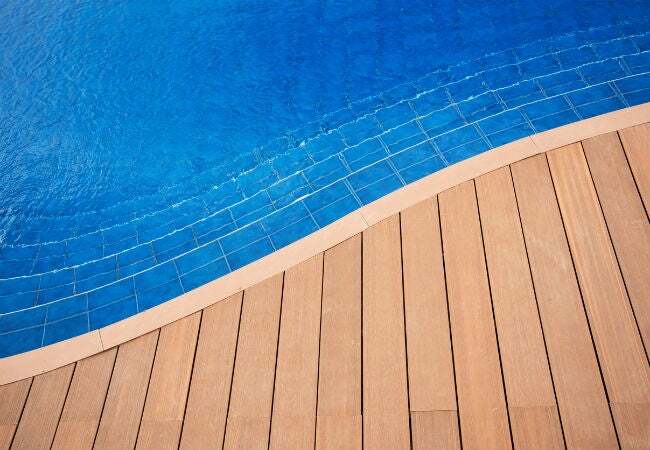 Great pool decking starts with a sound substrate. Poured concrete, pavers, and bricks all require excavation and a base of sand or gravel. Tile can be installed over a similar substrate or may require a concrete slab as a substrate (check the tile manufacturer’s specs). Wood decking requires a floor joist foundation.